A 4.5-year old female child of nonconsanguineous marriage was diagnosed as a case of congenital muscular dystrophy (CMD) on the basis of clinical findings, neuroimaging, mildly elevated creatine phosphokinase levels (279 IU/L), and immunohistochemistry studies on muscle tissue [Figure 1]. There was generalized hypotonia, diminished deep tendon reflexes, and predominantly proximal muscle weakness. There was marked laxity at the wrists and metacarpophalangeal joints and fixed flexion contractures at both the knees. 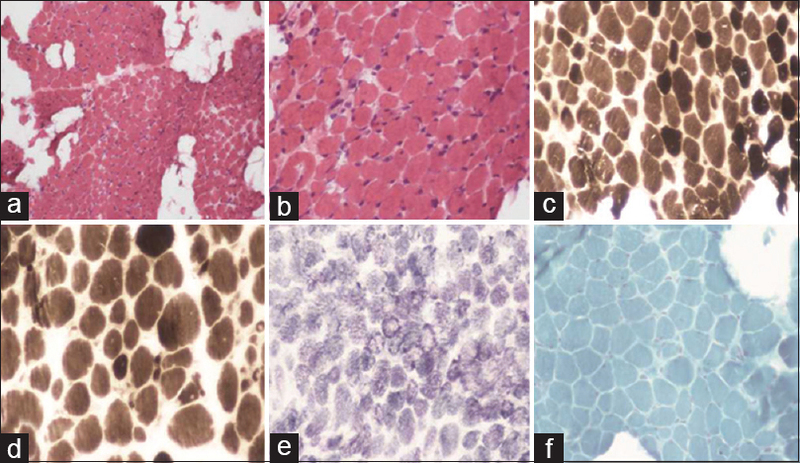 Electroneuromyography was suggestive of primary muscle disease, and muscle biopsy showed nonspecific features [Figure 1]a,[Figure 1]b,[Figure 1]c,[Figure 1]d,[Figure 1]e,[Figure 1]f.
The targeted gene panel sequencing, interrogating 80 known congenital myopathy and muscular dystrophy candidate genes, was performed on Illumina sequencing platform for molecular diagnosis, which identified a novel de novo heterozygous splice variation (NM_004369.3:c.6283-2A>C) in intron 17 of the COL6A3 gene along with an intronic insertion of 12 bp sequence (c.6283-1->CTGGGCTCTCCT) at the same 3’ splice junction [Figure S1]. These variations are not reported in the 1000 genomes, Exome Variant Server, Exome Aggregation Consortium, and the Single Nucleotide Polymorphism dbSNP databases, and the region is conserved across primates. The NGS data analysis pipeline was described earlier. 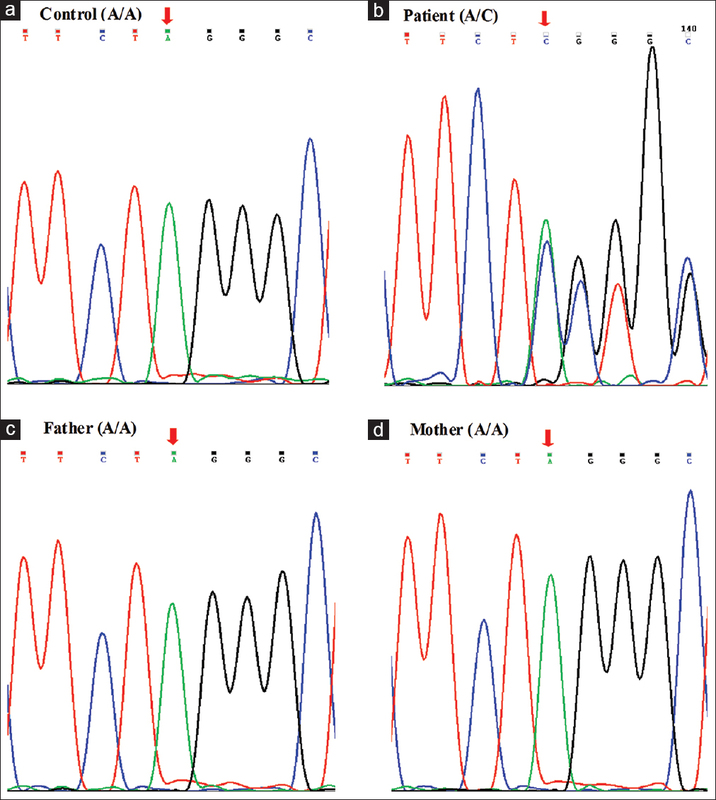 Sanger sequencing of the amplicons using ABI 3130 Genetic analyzer (Life Technologies, CA, USA) confirmed these mutations in the patient and a homozygous normal status in both the parents [Figure 2]. 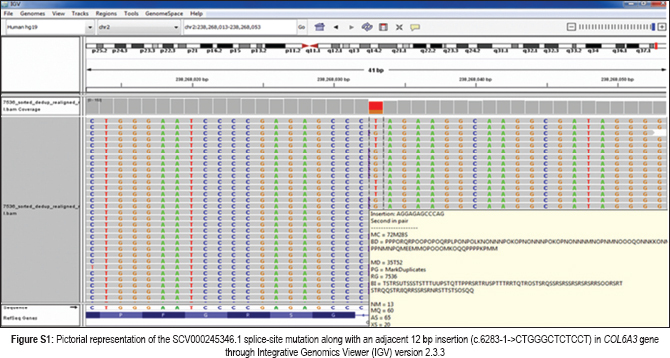 The c.6283-2A>C mutation was assessed using web-based programs for analysis of potential splicing aberrations,, all of which scored low for the mutant splice site [Table S1] and [Figure S2]. Further functional analysis using complementary deoxyribose nucleic acid (cDNA), synthesized by priming of 1 μg total ribose nucleic acid (RNA) using SuperScript™ IIIFirst-Strand cDNA Synthesis System (Invitrogen, Carlsbad, CA) followed by polymerase chain reaction (PCR) around the mutation and bidirectional Sanger sequencing revealed absence of complete exon 18 of COL6A3 gene in the patient [Figure 3]. The exon 18 skipping retains the reading frame and is predicted to introduce a 9 amino acid deletion in the triple helix (TH) domain of the protein, which is predicted to serve as a cell attachment site as a part of type VI collagen. In all Col6 proteins, the TH domain is the major contributor to the shape of the secondary structure. In addition, the region is highly conserved across the species. It is possible that these splice-site mutations, deleting the whole exon 18 (equivalent to 9 amino acids) from this important TH domain of the protein, has a damaging influence on the structure and function of the alpha 3 type VI chain of collagen, which ultimately may lead to the affected phenotype of the patient. Finally, to conclude, in the present study, we report two simultaneously occurring potentially pathogenic novel mutations–a denovo 3’ splice-site c.6283-2A>C point mutation and a c.6283-1->CTGGGCTCTCCT insertion in the COL6A3 gene, detected by targeted gene panel sequencing, in a patient diagnosed with CMD. Targeted NGS test results helped us to diagnose the patient as Ullrich Congenital Muscular Dystrophy type 1 (OMIM #254090). We have reported the c.6283-2A>C variant to ClinVar (SCV000245346.1). Science and Engineering Research Board (SERB), Government of India is acknowledged for funding support (SERB file no. YSS/2015/001681). Das Bhowmik A, Dalal A. 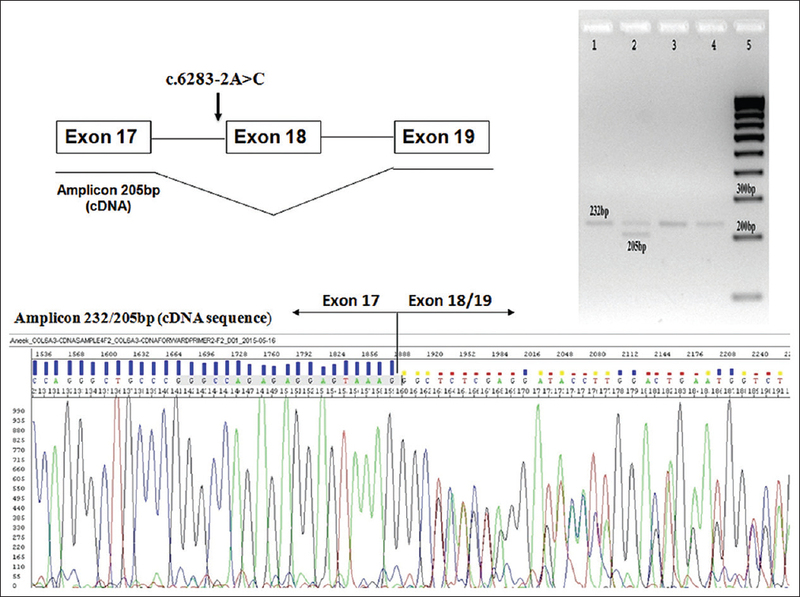 Whole exome sequencing identifies a novel frameshift mutation in GPC3 gene in a patient with overgrowth syndrome. Gene 2015;572:303-6. 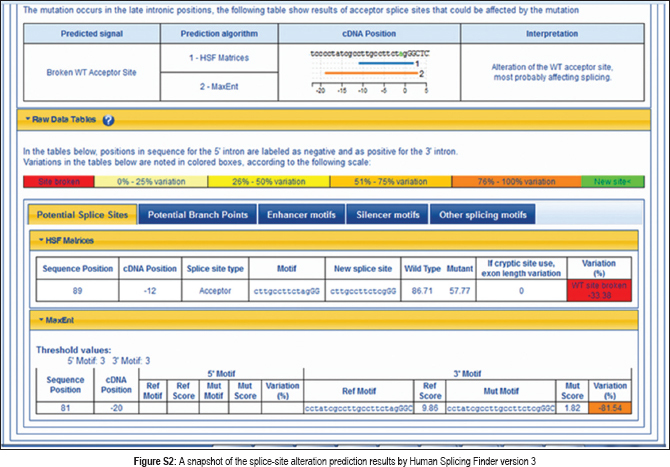 Desmet FO, Hamroun D, Lalande M, Collod-Béroud G, Claustres M, Béroud C. Human Splicing Finder: An online bioinformatics tool to predict splicing signals. Nucleic Acids Res 2009;37:e67. Spurdle AB, Couch FJ, Hogervorst FB, Radice P, Sinilnikova OM. IARC Unclassified Genetic Variants Working Group. Prediction and assessment of splicing alterations: Implications for clinical testing. Hum Mutat 2008;29:1304-13. Stokes DG, Saitta B, Timpl R, Chu ML. Human alpha 3(VI) collagen gene. Characterization of exons coding for the amino-terminal globular domain and alternative splicing in normal and tumor cells. J BiolChem 1991;266:8626-33.